The great sage Valmiki asked Narada, the foremost of the saints, versed in Vedas, Tell me O Saint who is at present, the most accomplished, learned, powerful, noble minded and of excellent moral character. For this the great Saint Narada said there was a famous being by the name Rama who was supremely intelligent, deeply versed in the Vedas, highly skilled in archery, possesses an excellent memory, wise, compassionate and valiant. Rama was born in Ayodhya and married in Mithila, now in Nepal. Not far from Mithila is Sitamarhi, where Sita was found in a furrow, still revered as the Janaki Constructed by her father Janaka. Rama and Sitha left Mithila for Ayodhya Via Lumbini. In 249 B.C., Asoka created a pillar in Lumbini with an inscription referring to the visits by both Rama and the Buddha to Lumbini. Rama, Lakshmana and Sitha Left Ayodhya and went to Sringaverapura _ modern Sringverpur in Uttar Pradesh where they crossed the River Ganges. They lived an Chitrakoot hill where Bharata and Shatrugha met them and the brothers performed the last rites for their father. In fact, Rama who was born of Kausalya's womb was honoured by all. In fortitude he was like Himalayas, in might he was like Vishnu, in forbearance he was like the earth in bounty he was like Kuvera, the giver of wealth. In fact, the great Valmiki after having heard from the celestial Narada, the Rama's birth, his provess, his generosity, his goodness and his popularity, his marriage with Janaki, Kaikeyi's malice, Rama's excite, Dasaratha's grief, his meeting with Hanuman, friendship with Sugriva, destruction of Bali, Hanuman crossing the sea, his sight for Lanka and Ravana's palace, Hanuman's interview with Sita in Asoka forest, presentation of Rama's ring to Sita by Hanuman and Hanuman's fight and burning of Lanka Valmiki began to compose the enchanting story of Rama. Indeed, one cannot understand Hindu Dharma unless we know Rama, Sita, Bharata, Lakshmana, Ravana, Kumbakarna and Hanuman. It is an acknowledged fact that the traditions of the "Ramayana" form an integral part of the shared cultural heritage of India and Sri Lanka. Further no other poetic work has influenced the thought, life and culture of the people in the ancient world as the "Ramayana". The characters of Ramayana have become the repositories of valour, virtue, spiritual insight and compassion. They exemplify the pursuit in establishing a moral order in an imperfect world. Furthermore, Sri Lanka had a special significance in the Ramayana's traditions. 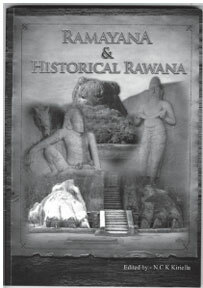 It was a land of two principal characters _ Ravana and Vibishana. Although brothers, they were men of opposite ways. Ravana swayed from the path of Dharma while his brother Vibishana was steadfast in his adherance to the principles of Dharma. Indeed, Sita Eliya, Ravana Ella, Ramarasala, Sitawaka and Kelaniya are some of the prominent localities associated with the Ramayana traditions. Further, there is a belief that Sita was initially kept in confinement at these localities. Later, she was taken to "Asokavanam", which is identified with "Seetha Eliya" in Nuwara Eliya. Furthermore Rama's bravery in searching for Sita and combating a terrible war to rescue her and their honour is matched by Sita's total affection to her husband.